Calling all horticultural industry professionals! The first of 2019’s horticultural exhibitions are concluding, bringing fresh momentum to the industry’s spring and summer events. Europe, and specifically Amsterdam, is promising to pack a punch with upcoming events. The 2019 GreenTech Amsterdam recently announced open registration for exhibitors and attendees for the 2019 trade show. Mark your calendars for June 11 – 13, 2019 at the RAI Convention Center, Amsterdam, Netherlands. This year’s convention marks the fourth instalment of the GreenTech Amsterdam. Due to its previous and successful bi-annual showings, this year’s convention will mark the sponsor’s move from a biannual tradition to a yearly calendar event. This is encouraging for the horticultural industry, as it is the international trade show that provides attention to technologies at the early stage production process. Its focus on crop sustainability and production process innovations is in line with the target audience of FreshPlaza and the horticultural industry of fruits, vegetables and fresh produce. There are many predictions about the future of the global horticultural industry that will be highlighted at GreenTech Amsterdam. Where the predictions will lead is yet to be seen. For its part, GreenTech Amsterdam promises to provide a unique look into the future of the industry. GreenTech Amsterdam again embraces four themes – crops, energy, people and water. Each theme will be integrated in to the 3-day presentations and the topics are expected to expand on last year’s trade-show initiatives. The focus of event exhibitors will be on sustainable production and potential innovations, especially looking at advancements in greenhouse technologies and a fresh look at robotics and AI. This year’s GreenTech Amsterdam will offer the newest news from industry innovators and again offer opportunities to engage in break-out sessions. Expect GreenTech Amsterdam to showcase the very latest in innovative technologies and developments in the manufacture and production of fruits, flowers, and vegetables. The attendees will be from source producers, investors and governments in the horticulture industry. Mariska Dreschler, GreenTech’s Director of Horticulture, anticipates up to 500 industry representatives and exhibitors with participant exposure to over 11,000 visitors, providing a vast source, network and business opportunities for your b2b company. GreenTech Amsterdam will again offer a forum for investors, growers and suppliers to provide input on current tech conditions, and future primacies and prospects in the global horticulture community. GreenTech Amsterdam will host its summit on June 12. Ms. Dreschler announced industry leaders in production technology will participate in a round-table focused on engaging and impactful topics for the future of the horticulture industry. A sneak peek about one such conference topic was revealed by Ms. Dreschler to be a discussion on the viability of “autonomous greenhouses”, which is the subject of some aspiring research out of Wageningen University, Netherlands. Like the 2018 awards, finalizing the event will be an announcement of the GreenTech Innovation Awards, where both exhibitors and attendees are eligible for industry-coveted awards. GreenTech is your opportunity to make and nurture international networks since Greentech is at the center of global connections for your industry. 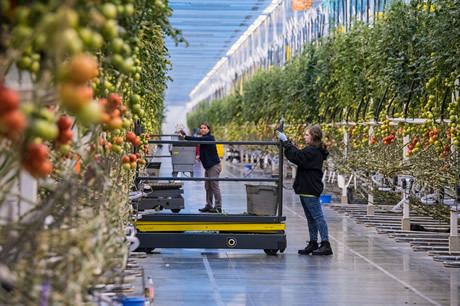 FreshPlaza has learned that, along with the networking and focused presentations at the RAI convention center, GreenTech will organize Amsterdam tours that focus on vegetable and flower innovations and displays. GreenTech Amsterdam is scheduled during the same week as the Flower Trials in Amsterdam (scheduled for June 11-14). This opportunity gives an added benefit for attendees to schedule a powerhouse of activity and convenience sightseeing in the beautiful city in Amsterdam or to make a day trip from Amsterdam to one of the many villages or nearby cities in Holland. Canal trips along the Amsterdam countryside and other great things to do in Amsterdam can be scheduled to advance networking opportunity during your stay.